Google usually displays a list of links below the top search result for navigational queries. 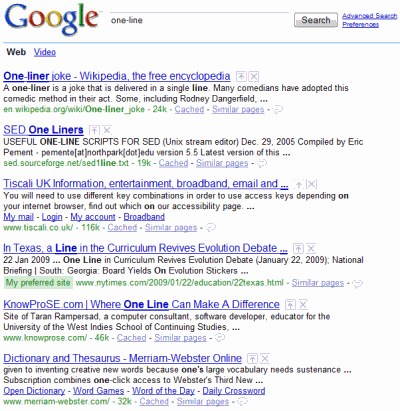 "The links shown below some sites in our search results, called sitelinks, are meant to help users navigate your site. Our systems analyze the link structure of your site to find shortcuts that will save users time and allow them to quickly find the information they're looking for," explains a help page. The feature has been updated frequently: it initially included four links, then it started to display the web addresses, the number of sitelinks doubled in 2007 and last year Google added search boxes. For some queries, Google reverted to the initial compact format and it shows four sitelinks on a single line. What's more interesting is that sitelinks are no longer displayed just for the top search result. Yahoo and Live Search have a similar feature and they also show the main sections of a Wikipedia article. "One common thread behind the use of sitelinks by all three search engines is that the concept behind providing internal site links to pages on a site that shows up in search results is to improve the searching experience of people looking for information by providing links to pages within a site that searchers likely would want to find," suggests SEO by the Sea. Search engines generate sitelinks based on the navigational links from a site, sitemaps, traffic data and other sources. What is 'My preferred site' link here? It could be a test or maybe there are two separate formats. A label for the Preferred Sites experimental feature. It's available as a Google Search Experiment, but I couldn't enable it from that site (I suspect that you can only enable it from Google Labs if you're in the US). not being able to suggest to google which links to display as sitelinks b lows c hunks!